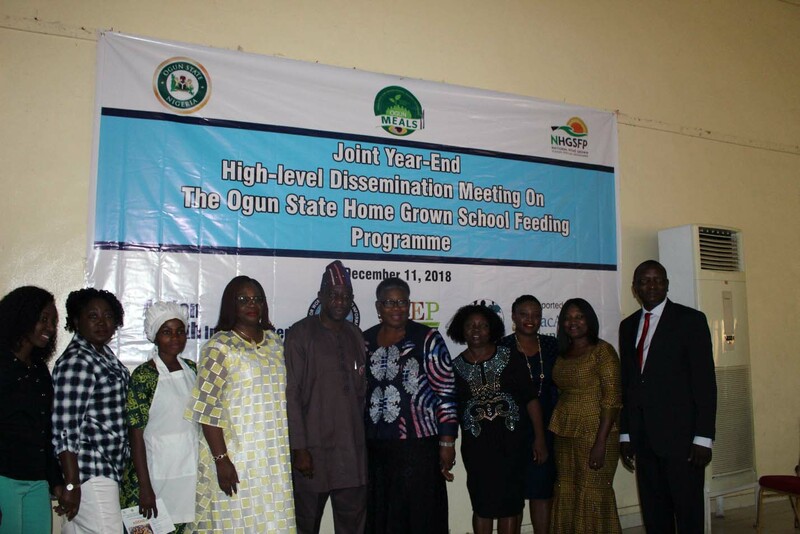 The Year-End High Level Dissemination Meeting on the Ogun State Home Grown School Feeding Programme (OGHGSFP) which was conducted on December 11, 2019 had over 200 participants drawn from various stakeholder groups. They included Government Officials, the Monitoring Cohort, members of Parent Teachers Association/School-Based Management Committee (PTA/SBMC) members, Local Government Education Secretaries, Local Government Desk Officers of the HGSFP, Health Teachers, School Heads and Cooks. Participants were drawn from the different Local Government Areas where monitoring is being conducted by the three partners: Action Health Incorporated (AHI), Centre for Women’s Health and Information (CEWHIN) and Women’s Consortium of Nigeria (WOCON). Following the welcome address given by Mrs. Adenike Esiet, the Executive Director of Action Health Incorporated, Mrs. Tinuola Shopeju, the Programme Manager, OGHGSFP gave a progress report on the programme. Mrs. Shopeju said she considered it an honour for the HGSFP to be celebrated, therefore she expressed her appreciation to AHI, CEWHIN, WOCON, TEP Centre, and the MacArthur Foundation who had vigorously driven the Ogun Home Grown School Feeding officials in the last one year to be able to achieve what was being celebrated. She attributed her team’s success in monitoring the OGHGSFP to the support given by the Cohort and the MacArthur Foundation, and noted that Ogun State had become a model and a point of learning for other states of the Federation. She enumerated the economic benefits that have emerged from the School Feeding Programme, which has translated into employment creation for so many people in the state, increment in enrolment in the schools and better growth rate for the children because of the nutritional value of the meals. She concluded her report with a promise for greater achievements in the coming years. After the progress report by the Programme Manager, representatives from the different organizations that make up the Cohort took turns to present to participants, their activities in monitoring the OGHGSFP within the last one year, achievements, challenges and recommendations. It was also specifically recommended that the Home Grown School Feeding Programme should be adopted as an educational system policy in Nigeria. At the end of the success stories, Barrister Leke Adewolu, the Honourable Commissioner for Special Duties and Inter-Governmental Affairs, gave his remarks. He expressed his happiness on all the success stories shared and also on the fact that other States are expressing their desires to understudy the HGSFP in Ogun State. He promised that the State will put in more efforts to ensure that more results would be achieved in the coming year. The meeting ended with vote of thanks given by Mr. Adeogun, the Project Coordinator, WOCON.